EasyJet, the budget airline that sells flights like sweets, is jumping on two of the latest tech trends to make life a little bit easier: drones and 3D printing. We heard EasyJet talking about drones last year, and now the budget airline is close to using the technology itself. The company announced this week that it will start using drones for safety inspections from 2016 onwards. “We have made great strides on our work with drone technology having successfully tested automated drone inspections of our aircraft and we have agreed a new collaboration with Airbus for an inflight prognosis tool,” said EasyJet chief executive Carolyn McCall. 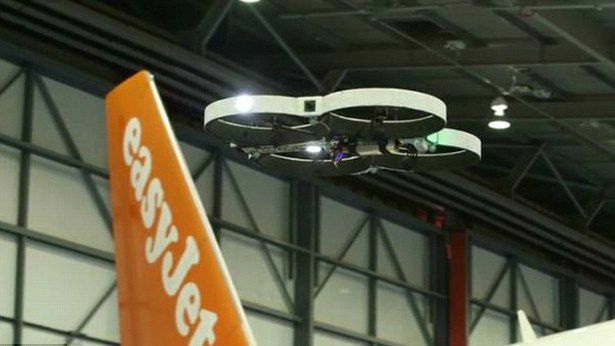 According to reports, EasyJet will use the compact drones to circle the aircrafts while sat stationary at gates, ensuring everything is safe and sound before take-off. Not only should drones speed safety checks up, but it will also put an end to potentially dangerous human inspections. What's more, the company is also beginning to trial 3D printing as a way to produce replacement aircraft cabin parts. The next generation of EasyJet are set to be at least partially 3D printed too. "The use of these emerging technologies frees up our engineering and digital teams to enable them to undertake more skilled tasks, keeping our costs down which in turn keeps our fares low,” said EasyJet engineering chief, Ian Davies. To add to its ton of incoming tech, EasyJet has also launched a new iPhone and Apple Watch app. What's next, virtual reality? Oh wait, Qantas already did that.